March 29, 2006 was the day that former Liberian dictator Charles Taylor never dreamed about few years ago. On this day in Liberia, the city of Monrovia was in a total shock. The ocean was calm and quiet. Even the green forest surrounding the Roberts International airport could not believe the scene of the day. The only disturbance was the den of dozens of heavily armed UNMIL soldiers on guard at the RIA. The positions of the UNMIL soldiers indicated that something very important was happening not only in the history of Liberia, but Africa as a whole. Suddenly, the weather in Monrovia turned into a rainy cloud. Moments later, a Nigerian jet hit the bumpy runway of the Roberts International Airport. The spirits from the great beyond and residents of RIA and surroundings took positions to find out what was being delivered to Liberia aboard the giant jet. Other spectators that did not have access to radio thought the jet was delivering some humanitarian aid. They stood patiently as the unfolding events took place. The automatic doors of the jet dropped down. The dictator clad in a creamy Nigerian agbada style suite rose from the depths of the jet to the doorway. Bystanders witnessed the man who has reign so much havoc on the West African region being handcuff. Among the bystanders present was one of the dictator’s victims in person of Tiawon Gonglo, who now serve as Solicitor General in the fledging Ellen Johnson-Sirleaf government. Tiawon, a human rights activist on April 29, 2002 almost lost his life to the wicked hands of Charles Taylor and his blood thirsty armed men. 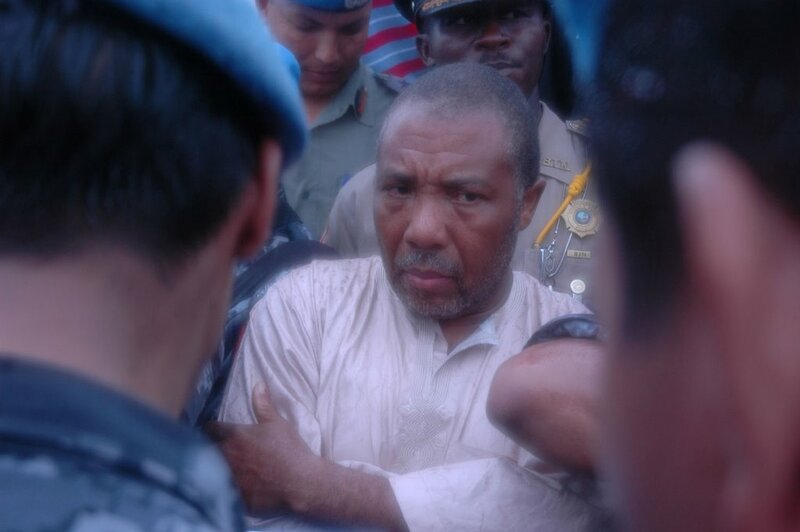 It was Tiawon who read Charles Taylor his Mirada right as the former dictator waggled his head before being cuffed by UNMIL personal. Thereafter, he was hopped on a chopper to Freetown, Sierra Leone where he’s expected to face trial for eleven counts of crime against humanity in the United Nation backed court. In august of 2003, before he was forced into exile in the northern Nigerian city of Calabar, Charles Taylor waived his white handkerchief to well wishers and said: “…God’s willing’ I’ll be back” but Taylor did not tell God or his well wishers how exactly he would be back, weather as a former Liberian president, free Liberian citizen or a war crimes prisoner. He left the options with God to choose from. As the old Biblical saying goes, “be careful what you pray for and be specific in your prayers”. Ironically, Charles Taylor was not specific in his request to God and so God did his optional selection based on Charles Taylor’s human right records. His prayer to be back to Liberia was answered but as a prisoner. On March 3, 2003 the UN backed war crimes court in Sierra Leone signed a 17 count indictments (now 11) alleging war crimes, crimes against humanity and other serious crimes relating to his support in neighboring Sierra Leone. The indictment was confirmed by the trial chamber on March 7, 2003 but was kept under seal. On June 4, 2003 the indictment was unsealed whilst Charles Taylor was attending one of his extravagant peace talks in Ghana. He narrowly escaped the arrest and hastily returned to Liberia. And so on March 29, 2006, Charles Taylor the extravagant, clueless dictator who name became a lexicon in West African politics for one and half decades was caught up in the web of his doing. He finally realized that life truly is a network of interconnected organisms which we human play a steering role. Charles Taylor now sit behind bars in limbo.